The great beauty or sadness of Scott Walker is how slow he moves in the 20th century. From the very beginning as a teenage singer to now is a magnificent journey. There are many who have long careers either in writing or music, but Scott Walker has always been a consistent quality-artist, who took his time, and not waste our time. "Sundog: Selected Lyrics" is a remarkable book just focusing on Walker's lyrics. As I read them, I can hear the music, but also I try not to listen to the melody that comes to the words (due to memory) and take the text away from the song. 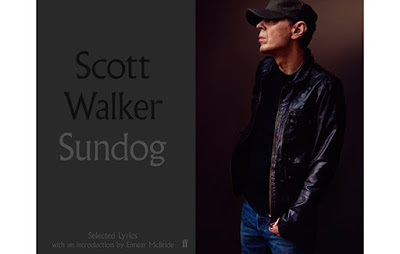 It's very clear to Walker and to Eimear McBride, who wrote the introduction, that these are lyrics and not poems, but to me, there is a fine thread standing between poetry and lyrics -especially in the mind of Scott Walker. "Sundog" is part of a series that Faber and Faber have been publishing over the years. For instance, there is a Jarvis Cocker book of lyrics as well as Billy Bragg. I suspect that Cocker may have something to do with the series, because he was (or still is) the editor at F&F. They all have the same elegant design and reading the Jarvis book as well as Scott's, they stand alone as literature. Walker is a genius in what he does. Reading the lyrics without the music in the background is like watching sculpture made out of words. In this sense, to me, he's very much a poet. He's not a lyricist in the sense of Cole Porter or Elvis Costello, but more of a sound artist who uses words. The brilliant aspect of his lyrics is that Walker can write about terrible violence or emotional distress but be funny at the same time. He has this incredible talent for throwing in one or two words or phrases that cut the violence of the piece and make it almost like a music hall entertainment. It's the contrast between his words, which are carefully written and thought out. When you hear his music, the words sometimes matches with the intensity of the sound, but a lot of times he throws in something ridiculous and it's really funny. The intensity of the work lightens up, but never loses its seriousness or purpose. It's a balancing act. In a way, it is like Jack Nicholson in "The Shining" yelling out "Here's Johnny." "Sundog" is superb poetry, or if you wish, song lyrics. I read the book in one sitting, but I'm going to go back to it again and again. The textures and how the word (or wordings) are placed on the page is equally important to the spaces in his music - where you reflect on what's happening aurally, as well as the sound mixing in with his magnificent voice. Great book.